Aye, the midges. I'm a teuchter so grew up with them. They're genetically drawn to my blood as a result and that plus the peely wally skin makes me a 'Midge Magnet'. As I was reminded filling up with petrol and octane booster in Kinlochewe. Much to the amusement of the filling station owner. "Aye, seeing you southern boys suffer on the NC500 is why I'm thinking of getting in a super unleaded pump"
I'm reading this , whilst eyeing the weather outside , Sunday morning , off to Kazakhstan on Monday morning ...so I think it's time for a run out , even though I have washed the car and put it away ........!! The weather was horrific for the start of this leg with low cloud and pouring rain in Inverness as I set off. But ever the optimist I filled up with super unleaded and set off towards Tain for my first distillery trip of the day on the A9. Leaving my last dual carriageway just past the start of the Black Isle I used the return to A roads to get my overtaking eye back in, and made good progress despite the torrential downpour. The overboost on Grace and the DSC module meant it was sure footed and quick even in these conditions. The Cromarty Bridge was also a fine site stretching across the estuary but the rain and traffic meant it will be a memory not a photograph. It was still chucking it down when I pulled into Glenmorangie. But don't let the rain affect your pronunciation. It's only ever been supposed to be pronounced one way. On this tour I visited nine distilleries and this was one of the best. Glenmorangie is distilled in gin stills, something I've known since a friend from Tain told me in the Blue Lamp while we were at Aberdeen University. I'd never seen them but they were beautiful to behold. And the lad taking the tour was knowledgable and enthusiastic. Included in this tour were samples of wort and wash to 'taste', a novel experience, as well as some lovely malts to savour at the end once we'd had a full tour inside one of the warehouses. Once the tour was done I hit the road, under pressure to get to Wick inside two and a half hours in rotten conditions. The winding roads up the east coast aren't always as popular on the NC500 but even with the pouring rain I found the landscapes lovely. In the sunshine I'd imagine it would have been even better. But what I had was driving rain, increasing traffic and low cloud leading to fog on some of the climbs. The overtaking was given a break at Latherton where the A9 branched northwards and I turned, pretty much on my own, onto the A99. This road was much clearer and I hurried on to Wick. I got there in good time plus I enjoyed the chance to challenge myself as well as the car on what had been a pretty intense session. Old Pulteney was a lovely, remote but slick experience. Like all distilleries visited the enthusiasm of the staff is incredible. Here amplified by the small size relative to other malt producers and the remoteness of their location. It was a lovely tour and recommended. As I left the distillery the rain had stopped. I then turned Grace back onto the A99 and headed towards John O'Groats. The landscape changed massively at this point, becoming bleak and moonscape like. In the drying wet it was empty and bleak. But striking. As I hurled towards John O'Groats I genuinely felt I'd stepped into a different land. It's not pretty but it is breathtaking. John O'Groats was 'busy' relative to the empty roads getting there. I took a short run to the Duncansbyhead Lighthouse as well. Then, conscious of time, the need to source fuel and with some nice malt samples from my tastings to try I headed west on the A836 towards Thurso. Passing through Thurso I found a fuel stop and brimmed Grace with 95 octane fuel plus a Millers octane booster. Having done that the A836 was the choice again for getting to Bettyhill. Dounreay is an impressive sight, dominating the flat skyline. But then the terrain becomes more undulating and the curves more pronounced. The dash from Thurso to Bettyhill, on drying roads with dusk creating the magic hour lighting so beloved of Terence Malik, was as beautiful a driving experience as I could remember. Soulful, in the non dualist sense of that word. Sublime might be another. I arrived at Bettyhill Hotel (huge from me ) as the sun crept towards the horizon. Checked in, I grabbed a light bite then set out to plan ahead for the next day and enjoy the magical light. You will regret it , take the Turbo .....😎😏.... tell her to rough it for once ......! Is good and accurate. But my tour takes on more than the designated 500 miles plus, shock horror to regular forum members, I've never been a crowd follower. But I follow what I think is the essence of the route. With some subtle but important deviation. In this leg it's missing out Lochinver. As a Proclaimers fan that wasn't an option. Plus it just felt good road to drive. So I followed the A836 west from Bettyhill, turning into the A838 after Tongue, it whenever possible followed the coast on my way south. The octane booster and Sport button meant MPG was awful. I hungrily refilled at Durness. Then furiously frustrated that tendinitis stopped me running to Cape Wrath and back, I tore further down the A836 towards the famouys Kylesku bridge. Stopping en route to enjoy the sheer scale of the scenery. Despite my care I had two close 'off' moments, with one coming a couple of miles short of the iconic Kylesku landscape feature. A camper van, as inocous thing as you could imagine, was my overtaking challenge. All was good till the oblivious driver drifted right. Shuffling myself away also to the right the sport overboost kicked in just as the right rear wheel touched gravel, the edge of the road and drifting sideways, air. I genuinely thought I was off. Then the drive shifted VERY perceptibly to the front, the rear drifted sideways into air but the left rear dug in and between it and the front Grace languidly pulled me out of trouble. A little bit of fish tailing and the car settled again. The camper driver no doubt unaware of what had happened. I was aghast at the event but amazed by the car. I patted the dash and thanked her once we were past. When we pulled into the lay-bye at Kylesku Bridge the same camper van also pulled in. I kept my trap shut (though my face said it all) as what was the point? The old boy and his wife were oblivious. So when they waved I waved back. No contact, no foul. (as someone I met coming the other way was) I'd suggest you take it too. At the junction after the Kylesku Bridge I left the A838 and joined the A894. As optimistically named an A road as I've ever come across. I really wanted to travel to the bay of the Summerilses but the rain came in again so I settled for the Ullapool road and rejoined the A835. A quick stop in Ullapool, a town I'd last visited aged five, I hungrily gobbled up some 97 octane and headed for Gairloch. The long way of course. 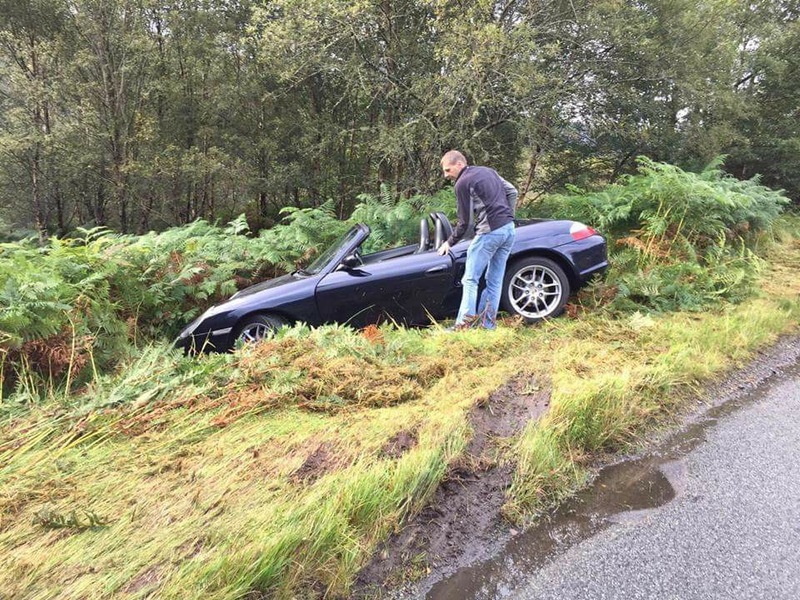 I headed south on the A835 and then jackknifed onto the A835. And settled into the worst hotel in the modern era, the Gairloch Hotel. Woeful. A long day and rarely above three figures. But iconic and up there. This track from our mutual mucka sums up for me how I felt at this point in my trip. EDIT - of course the context of our lives are very different to those depicted in the song! We stayed at the Bettyhill Hotel on our trip nearly two years ago and we were told to move our cars around the front as the locals who get drunk there may take a shine to our cars, I also got a puncture from broken glass in that carpark which ruined my last day of driving as I couldn't get a tyre that far away from civilisation. Although the food was good there with a nice view. That's a shame and not good. Suspect things have moved on since then? My car was ummolested. The current owner seems quite switched on. Further..... they called me and told me I'd left my iPad in the bar. It was home before me. Doubt I got local privilege as the owner is from Yorkshire. But a puncture is a puncture and an utter ball ache. And as you say not a great place for it to happen. It was my two fears: petrol or punctures. Hopefully Mr Knopfler will have a new album and tour out next year. I concur with the sentiment entirely young man! The damp caught my pal out last week. It was slippery where he went off though! Very.